Our sleek wood pendant light kits ship flat-packaged. Each kit contains 20 pieces (we also include a light kit with wall plug). 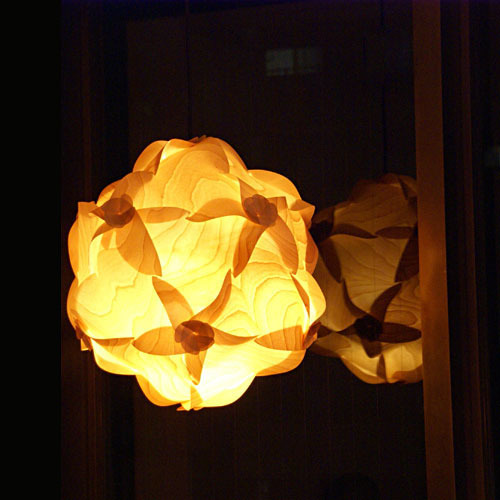 When assembled, they look absolutely stunning and emit a warm soft glow of light! Made completely in the traditional Japanese way, our high quality 'puzzle-lights' are hand-crafted in Japan of 'sakura birch' wood sourced from sustainable resources. No tools required. This high-quality pendant light features a gentle, expressively tensile shape. Perfect for friends, family or loves ones, or for your own home. The wood pendant light kit is made and imported from Japan. That's right; not in that other country. Did we mention this makes a great gift? These birch wood pendant light kits are hand finished by master artisans in Japan which is precisely the reason we like them. Customer must be able to accept understandable variations in wood grain pattern and wood coloring inherent to any natural wood product. These are not considered flaws but works of art by mother nature. Each lamps is unique; no two lamps are ever alike. Presented in a simple yet efficient triangular box. Assembled size: 17.50" tall, 17.50" wide, 17.50" depth. Flat packaged size: 13" wide, 17.50" long, 0.80" depth.